The first 4 episodes of Full Metal Panic! The Second Raid are anime original. The remaining episodes adapt novels 4 and 5 of Shoji Gatoh's light novel series Full Metal Panic! Adaptation: Full Metal Panic! Sigma, Full Metal Panic! If you haven't watched the original Full Metal Panic! series, you should watch it before watching The Second Raid, because it's the sequel to the original series. In regards to Fumoffu?, you don't have to watch it before TSR. With that away, let's get to reviewing. The story in TSR easily surpasses any 13-episode show I've watched as of writing this review. The pacing varies a bit; suddenly this and that happens and then it's done quickly, and you may be left baffled ), but some scenes are very slow, like the scene when Chidori cut Sousuke's hair. Some may not like that, but I think that the pace was just right at the right moments, and that it created just the kind of mood the scene needed. TSR moves a bit away the funny high school life of Chidori and Sousuke, leaving the room for more drama and a couple of episodes focusing on Chidori and Sousuke's emotional struggles with themselves and each other after certain events happen. However, it preserves a bit of the great high school humor you're probably familiar with by now, especially in the earlier episodes. The story was excellent in my opinion, and the only thing that drags it down is the rather loose ending; it seems like things aren't over yet. There are also small bits of fanservice here and there, just so you're warned. The animation quality is, to quote a friend of mine, &quot;unreal&quot;. I thought the quality of the original series was excellent, but this just blew me right out of the water. The coloring is vivid, and the level of detail in the backgrounds is very good. The Special effects are very good too, and the lighting effects are astounding. In fact, the best I've seen. The detail of screens and monitors is incredible, too. Shortly summarized, the animation quality is just perfect. The soundtrack is a vast improvement from the original series. The OP and ED themes are as good as ever, and songs I'd listen to over and over again. The background music is incredible, too. The pieces are great to listen to, and they fit right in with the mood, and amplify it. The tense music during Chidori's episode was the best when it came to setting the mood, if you ask me. The sound effects are nothing I can say bad things about either, from birds chirping to explosion sounds. The characters have gotten a lift, too. Of course, it's the characters we have learned to love, and now they're getting some good character development. Especially on Chidori and Sousuke's part. I really liked how they portrayed Chidori's feelings towards Sousuke, and in the finale episodes, Sousuke changed a lot. He's slowly turning into a human and not just a stiff guy who acts only on orders. Throw in a hilariously paranoid bad guy as well as two messed-up twin sisters, and it's perfect. All in all, I really, really enjoyed The Second Raid, but I do hope there's more Full Metal Panic! to come. It is fairly uncommon for a sequel to excel over the original in virtually every way possible. That is, typically, even if the sequel is mostly superior, there are often a few noticeable elements missing from it which made the original enjoyable (A personal example would be Batman Begins and The Dark Knight). Full Metal Panic: The Second Raid (TSR), on the other hand, is one of these rare instances of a sequel surpassing its predecessor in all respects. All around, The Second Raid has a better plot, better scripting, better character development, better action, better humor, and better animation. To get a good idea about the essence of The Second Raid, simply imagine a tighter, darker, more focused, serious, and mature series which takes all of the good and worthwhile elements from the original and improves on them. In a nutshell, this is Full Metal Panic: The Grown-Up Version. First and foremost, what The Second Raid does remarkably well is genuinely challenge its characters, not only physically and psychologically, but also morally. Unlike much of the tactical action sequences of the first season, the sense of danger and isolation is now much more real, as well as enemies which are genuine threats and not simply a string of forgettable, one-dimensional "terrorist/bad guys" (Takima Kugayama and his "sister" from the first series) or anonymous henchmen to be easily defeated. For a more specific contrast, think of the scene from the original Full Metal Panic where Melissa Mao, armed with only a rifle, taunts and entire troop of hostiles from a rooftop, with no cover, apparently not the least bit concerned about being shot, despite the fact that half a dozen enemy arm slaves have their guns trained on her. On the other hand, simply seeing TSR's brutal and effective killing machines, the Xia twins, in action should be enough to realize that the days of relatively easy and unrealistic victories are over. Furthermore, our heroic protagonist Souske Sagara, who was previously a fairly single-minded "military maniac" with very little sense of self-doubt, now finds himself actually having to ask the important, life-changing questions, namely, who am I? What am I doing? Is what I am doing right? and more specifically, Do I like doing nothing but following orders? Do I like being surrounded by weak people who constantly need me for support?--All questions which the first series never dares to ask. As an example, a particularly memorable and extremely well-written phone conversation occurs between Souske and the mysterious MITHRIL intelligence agent, Wraith, in which he is for the first time forced to deal with the actual consequences of his inability to adapt to civilian life--thus the series' oft-used and never-questioned "comic relief" device quickly and seamlessly turns into an opportunity for some very interesting and dramatic character development. It is also impressive the way in which the writers subtly work in a couple references to the seemingly insignificant events from Fumoffu . Later on we also get to witness firsthand what happens to Kaname when Souske is no longer there to protect her. The results are equally as enticing. This motif applies not only to the characters, but MITHRIL as an organization itself. In TSR, we are no longer simply expected to believe that a mercenary organization which acts as some kind of a non-partisan global police force ("we fight terrorists and blow up drug factories" [sic]) can exist without its own set of serious internal problems and existential, even moral dilemmas. The most prominent instance of this is the way in which the issue of double-agents simply working for the highest bidder (i.e. mercenaries being mercenaries) is dealt with in a much more serious and significant way than the first season. TSR singlehandedly makes MITHRIL into a well-rounded, believable organization, and not simply a bunch of people with high-tech equipment on a high-tech submarine--as was implied in the original series. Aesthetically, The Second Raid is, not surprisingly, also a significant improvement over the first series. Kyoto Animation, now known almost exclusively for their "moe" shows, demonstrate their ability to make an action series which looks just as good, if not better, than most similar shows coming out today. The CGI is surprisingly well integrated, the character designs are still faithfully adapted from Gonzo's original, and the background designs are detailed and believable (the production staff did some lengthy on-site research of downtown Hong Kong). In fact, the sheer attention to detail in general is one of the things that makes this series truly stand out on the technical level. This includes all the little things which add to the overall sense of realism, particularly in the action scenes, such as a gun jamming, someone stumbling or tripping while running, desperately padding the ground behind them for an object to throw, or even something like tiny drops of bottled Scotch hitting the table during the pouring process. On a audio-related note, ADV's dub of this series is one of the best I have heard thus far, especially in regards to rendering important conversations and lines of dialogue in a strikingly dramatic, yet believable fashion. So while the examples are too numerous to list exhaustively, all of this hopefully can somewhat elucidate how well The Second Raid in essence works within the confines and limitations of the "Full Metal Panic universe," while at the same time managing to fully flesh out many of the interesting and underdeveloped potentialities of that universe. As a technical achievement, it is both more colorful as well as more violent, and as a writing achievement it is also much deeper and far more realistic. On the whole, this series manages to be highly engaging on both the intellectual and visceral levels, in a way that the first offering simply never fully realized. All these elements combined make Full Metal Panic: The Second Raid a personal number one favorite within the mecha-action genre. Aside from a somewhat "rushed" finale, perhaps my only complaint about this series is its length: at a mere 13 episodes, and an intentionally "open" ending, it naturally leaves one wishing for more. However, keeping in mind that a series' length can be a curse as well as a blessing, perhaps the relatively short episode count is something to be desired if the tightly-written, plot-driven quality is sustained throughout. After all, keeping in mind that decent chunks of the first series were simply filler, perhaps a 24-episode reboot of this would not be preferable after all. I believe this sequel is aimed at adults, not teenagers, and will have less appeal to people are faint of heart or generally unwilling to ask any serious moral and/or existential questions. Therefore for those who perhaps were, or currently are dismayed by the initial series' somewhat mediocre and "juvenile" nature, I can firmly say that the existence of The Second Raid makes it all completely worth it. Basically, this is Full Metal Panic's The Dark Knight. Only better. People may look at this and think of it as a typical mecha anime but if you’ve seen Full Metal Panic then you’ll know that this franchise isn’t loved only for its mechs. Full Metal Panic! 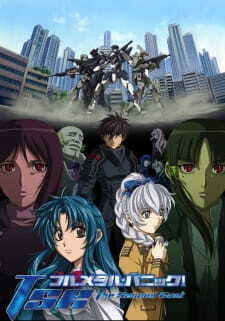 The Second Raid is the true sequel to the fantastic Shounen, Romance, Comedy, Mecha anime; Full Metal Panic! It basically starts where the story left of with teenage mercenary Sousuke Sagara continuing to fulfill missions for Mithril (the military organization), whilst protecting the teenage girl Kaname Chidori who is being targeted by other organizations. However this time round TSR focuses on a more serious storyline, full of drama. The series begins literally with a bang, as the Mithril team intervene with what seems to be a civil war. This first episode is basically just to reintroduce all the characters in one incredibly action-packed episode. This is then followed by a school episode, which is full of the usual hilarious comedy that this series is loved for. However after this small amount of light-hearted comedy the story becomes mostly serious, as it focuses more on the action and drama side of things, by introducing new enemies. The action is brought about by the exciting and nerve-whacking missions, which flow well from one another. There is a good sense, with the pacing of the action, in the series because it never rushes or drags things out like many anime tend to do. The drama on the other hand is what sets TSR apart from the previous ones as it really centres on the 2 main characters; Sousuke and Kaname and how the change in their situations affected them. With that fans get to see a different side to both of them, which is a good change however because of this the other characters (namely Tessa) are somewhat neglected. When looking into the animation of TSR, the one thing that comes to mind is the guys who produced it, “Kyoto Animation”. Having the series produced by KyoAni was the best move ever as we have consistent, crystal clear visuals, with completely fluid animation. The music is nothing particularly amazing but it definitely goes well with every situation; with nice pumping beats for the action and solemn tunes to go with the dismal mood in the drama. You know, honestly, I'm not sure why Full Metal Panic! The Second Raid (TSR for short) is not ranked with a higher score than it currently has. This show surpasses every aspect of Full Metal Panic! and Full Metal Panic? Fumoffu, which you should be watching first for the sake of chronological order. Like any sequel in a series, people expect the next one to deliver more than the previous, and deliver TSR has. Even though the prequel, Fumoffu, is a great comedy between the main characters, Sousuke and Kaname, TSR does not follow suit. Instead, think of the first series, but much better overall. First off, the story is great. For a thirteen episode series, TSR packs a lot of plot into it. The story is continuously interesting from the very first opening scene to the last ending scene. Again, although TSR carries a lot of it's predecessors' traits into this series, it is quite apparent from the first couple of minutes into the show that this storyline is darker than what fans may be used to. But, don't let this deter you because it sets a serious tone which attracts your attention throughout the entire thirteen episodes. It's not like TSR doesn't have any comedy in it, it's just that they use it more sparingly than the previous two series. All in all though, TSR storyline is a roller coaster of emotions, which will not disappoint anyone, as it is simply fantastic. What can I say about the art? It's very good. Again, compared to the other two series, the animation in TSR is a huge step up. The backgrounds are incredibly detailed, and the lighting effects used in this series are awesome. The colors are sharp and crisp, and the animation is smooth beyond belief. Just by watching even the smallest movement in the characters, you can see the effort that was put into TSR. This over-the-top quality animation is very apparent during the mech battles, which look just fantastic. There are only a couple of brief instances where the animation suffers a little, but it definitely does not take anything away from the series. The music and sounds in TSR are also great. The song artist from the first two series returns, and she does not disappoint with the opening and ending themes. Like the other openings and endings in the Full Metal Panic! series, the songs fit the tone of TSR perfectly. The background music is great as well, as it really sets the right atmosphere depicted by the story. As for the sound effects, they are as realistic as can be, and some of them were quite unique in my opinion. Ah yes, the characters. I must say that I simply love watching the characters interact with each other in the Full Metal Panic! series. From the minor characters to the major ones, TSR will not disappoint in this department. I kid you not; the character development in TSR is truly outstanding. Watching the relationship between Sousuke and Kaname in this series alone has personally made them my favorite anime couple. I definitely thought it was the most attracting part about the show, as you can really feel what they are thinking and what they are going through. This is why you need to see the other two series before this one. Watching these characters grow and develop in TSR gives you a roller coaster ride of emotions, and it is just fantastic. Well, finally, the enjoyment factor. To sum it up in three words: I love it. This is how an anime should be done in every aspect. The episodes in TSR were consistently very good, and it basically improved on everything that made Full Metal Panic! good in the first place, and turned it into something outstanding. By the way, I am not a critic who gives out an overall score of ten very easily. In fact, Full Metal Panic! The Second Raid and only one other anime have received an overall score of ten from me. But you don't have to take my word for it. Just give it a try for yourself.